Switzerland is a small country in Central Europe, and a perfect travel destination for those seeking the spectacular mountain ranges, enchanting towns and sophisticated cities. Whatever your reason for travelling to Switzerland, driving a cheap car rental is one of the best ways to get around. The city of Geneva is one of Switzerland’s most popular destinations, and you can arrange to pick up your pre-booked cheap car rental on arrival at Geneva International Airport (GVA). Explore Genève, the elegant "City of Peace", home to the United Nations and a city with a charming Old Town that includes the Place du Bourg-de-Four, prestigious art museums and the famed Market Street where you can buy a Swiss watch, before taking leisurely stroll around Lake Geneva. From the city, it is possible to make a trip by cable car to Mt. Salève and enjoy the amazing views over Geneva, the Jura Mountains and in clear weather, even the peak of Mont-Blanc in the Swiss Alps. Visit Bern, the capital of Switzerland, located in the centre of the country and well connected to other Swiss destinations. The small Bern-Belp International Airport (BRN) serves flights from across Europe, and Bern is a great starting point for travels across Switzerland, and a gateway to the Bernese Highlands. Interlaken, Spiez and Biel are all beautiful locations within easy reach of Bern, as is the lakeside city of Lucerne and the Swiss ski resorts of Gstaad, Zermatt, St. Moritz and Crans-Montana. Drive in your economy car hire to Zurich, or collect your vehicle on at Central Train Station (Zürich HB) or at Zurich Airport (ZRH), also known as Kloten Airport. Zurich is the largest city in Switzerland and the country’s financial centre. Visit Zurich Old Town (Zurich Altstadt) where you can enter the Kunsthaus, a prestigious art museum and don't miss a visit to Fraumünster, a gothic Church with Chagall windows, St Peter's Church reputed for its large clock-face and Le Corbusier House. 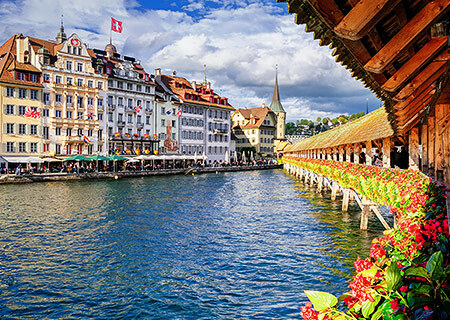 You can also enjoy a scenic drive along Lake Zurich before heading further north to Winterthur, the "City of Museums" and the Rhine Falls, the largest European Falls in Schaffhausen, and on to the city of Basel, which shares borders with France and Germany, is home to the influential Art Basel art fair and boast a truly beautiful medieval town centre. Finally, why not pick up one of our cheap cars at Lugano Airport (LUG) and drive to the city of Lugano, located in the Ticino Region in south-western Switzerland, near the Italian border. Enjoy strolling through Lugano historic city centre, relax in its numerous parks or simply laze along the shores of Lake Lugano while taking in the gorgeous lake views. Book online with Bingo Car Rental and enjoy great savings on your Switzerland cheap car hire. Bingo Car Rental is the place to come if you are looking for cheap car rental in Switzerland. For a family vacation or road trip with friends, hiring a car is often the cheapest way to get around, giving you the freedom and flexibility to explore at your will. Find out how you can keep your rental costs to a minimum when you search online with Bingo Car Rental, so that you make big savings on your holiday. We are able to present you with prices that are up to 30% cheaper than renting the same cars directly from the car rental company, and by comparing prices from the leading car rental agencies such as Avis, Sixt and Europcar, we ensure you get the rental car you are looking for at the lowest rates available online. A compact car, supermini or small city car… whatever name you give it, this is the most economical car you can rent in Switzerland. Ideal for couples, small families or city driving, not only are compact city cars the cheapest rental category, you will also find that these simple little run around cars keep fuel costs to a minimum. Look out for cars that deliver a good fuel economy (65 mpg being a good return, 80mpg is excellent), such as the manual transmission Volkswagen Polo with a diesel engine that delivers 74.3mpg or the Peugeot 308 Hdi, a great little small family car that delivers an impressive 79mpg. The Peugeot 107 and the Toyota Aygo are also reliable low price small cars, so choose a supermini with excellent fuel efficiency and find out for yourself how much money you can save. If you are travelling with a family and luggage, or are planning to travel long distances, a mid-size or full-size car is what you need. You can find cheap mid-size cars to hire in Switzerland, including the Toyota Auris Hybrid and the sporty Hyundai i30 automatic tdi. The larger Toyota Prius Hybrid is also a good option, delivering an impressive fuel economy of 83.1mpg, saving you money on your gas. Other cheaper full-size cars include the Volkswagen Passat and the Mercedes C Class, giving you the space and comfort you need for a long journey whilst you reduce rental costs and petrol consumption. Renting a Minivan or People Carrier in Switzerland is the cheapest way to transport 8 or more people, and you can take advantage of the great deals that Bingo Car Rental can offer online. The Chevrolet Spin is a simple yet stylish and comfortable 8 passenger MPV, the 9 seater diesel Fiat Scudo is an economical minivan, whilst for larger groups, the 12 seater Hyundai H1 delivers a great performance and excellent fuel economy. If you are planning a long road trip or a weekend in the country, a Toyota Previa Campervan rental might be the cheapest option for you, providing you with the freedom to travel in comfort and style, as well as an affordable, comfortable and safe place to sleep. With Bingo Car Rental you can choose from cheap car rental offers - various cars from many car hire categories - and book online in the easiest and safest way. By comparing rental deals from hundreds of reputable car rental companies in Switzerland, Bingo Car Rental is able to present competitive deals of cars to hire in thousands of locations. Hire a low priced car and drive safely with Bingo Car Rental!